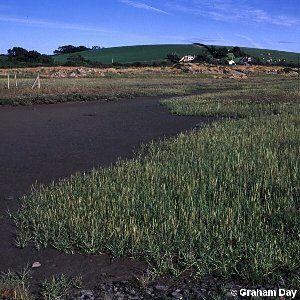 When Spartina x alterniflora (an American introduction) hybridized with the native English S. maritima it produced a sterile hybrid called Spartina x townsendii (Townsend's cord-grass). 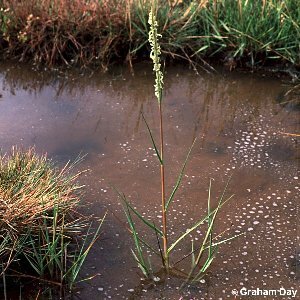 As often happens, some individuals spontaneously doubled their chromosome number to produce a fully fertile plant called Spartina anglica which can reproduce and spread by seed. It is possible that this species has originated in many places from Spartina x townsendii at different times. It was introduced for mud-binding purposes into Belfast Lough and Strangford Lough. It became extinct in Belfast Lough, but is now abundant in Strangford Lough, and has more recently spread into Dundrum Inner Bay and Carlingford Lough. Some of the cord-grass in Lough Foyle is also this species, perhaps derived locally from Spartina x townsendii. The plant is very vigorous and has had a "bad press" from ecologists and conservationists who regard it as a threat to eel-grass beds, which are an important food to migrating brent geese. However, recent research in the Irish Republic has shown that the colonies of this grass can support an unusually rich and diverse marine fauna.